Hurricanes, tornadoes, thunderstorms, and other natural disasters that come with torrential rains, storm surges, and floods wreak havoc where they hit and cause severe water damage to homes, commercial buildings, and public establishments in the area. 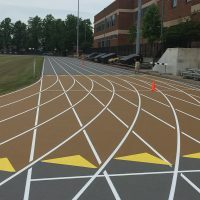 Sports facilities make no exception – floodwaters can be devastating to school gymnasiums, field houses, athletic arenas, and other sports centers. Even a relatively small amount of water from broken pipes, malfunctioning sprinklers, or leaky roofs can cause severe water damage to a sports floor, but flooding is sure to warrant extensive repairs or replacement. The longer water sits on the sports floor, the greater the damage will be – hardwood floors will begin to warp and rot, synthetic floor adhesives will be destroyed, mold will start to grow, etc. Therefore, speed is key in the event of water damage to a sports floor – if the excessive moisture is removed quickly and the area is dried out in a timely and effective manner, the floor can be saved. 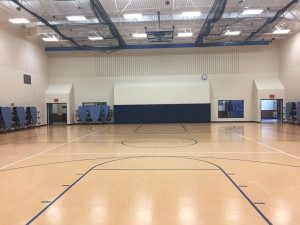 Depending on the extent of the damage and response time, even a hardwood gymnasium floor can be re-sanded and refinished without further issues – and gym floor refinishing is way less expensive and hassle-free than gym floor replacement, of course. So, what should school administrators and facility owners do if their sports floors get flooded? How can they get their facilities back up and running shortly after the disaster? Secure doors and windows and take any possible measures to keep a storm surge from infiltrating the building. 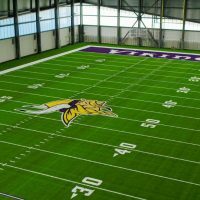 Good to know: If your school or athletic facility is located in an area prone to flooding (such as Tornado Alley or the Gulf Coast), a synthetic sports floor may be your best option. Poured-in-place polyurethane floors, for example, are extremely durable and oftentimes need only thorough mopping and slight repairs after flooding. 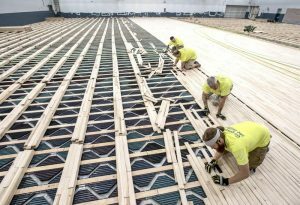 Modular flooring and floating floor systems are also worth considering – since they’re not glued down, they can simply be pulled up after an accident, dried, and put back in place. If a sports floor is flooded, removing the water and drying out the facility should be the top priority. Rebuilding and repairs come next – after the building is thoroughly dry. If the floor is submerged in floodwater, call a professional water removal company. They are better equipped to extract large amounts of water and will be able to safely deal with the cleanup and properly disinfect the affected area (floodwater contains hazardous contaminants and poses severe health threats). Step 2. Have the damage assessed – Call a sports flooring expert to assess the damage through moisture testing and determine the best course of action. Do not try to salvage the floor by contacting a restoration company first – they don’t know the specifics of sports flooring systems and will attempt to dry the floors in ways that don’t work (this may lead to mistakes that cost thousands of dollars). Step 3. Tear out and remove any porous materials that have been in contact with floodwater (water from a storm surge is full of sediment and microbes, so anything that has absorbed the contaminated water should be replaced). Remove badly damaged sections of the floor and subfloor, as well as the wall base up to about 6-12 inches above the water line (the highest point that floodwaters reached), as recommended by the flooring contactor you’re working with. Have the facility professionally dried out after flooding from a storm – your chosen flooring expert will make recommendations on how to best dry the floor if that is an option. If not, large fans will be used to dry the concrete after the floor has been torn out. If water penetrates through the cracks between the planks of a hardwood sports floor, it will be absorbed by the plywood sub-floor underneath. The plywood will expand, causing the boards to pop out. When the boards are popping out, you have no choice but to replace the floor (or at least the affected section). When the floor is just cupping a little, it can be dried out and saved. Step 5. Repair or replace the floor – Rebuilding too quickly after a flood can cause continuing problems such as mold growth, insect infestations, and deterioration of the wood, so you need to wait until the building is fully dry before you start the repairs. This may take a few weeks, but it is crucial to get the humidity level of the room and the moisture level of the wood back to normal. The typical moisture content for maple flooring is about 8 percent – at 12 percent or higher, the floor will have to be torn out and replaced (higher moisture levels cause the wood to buckle and pull free and can lead to mold growth and rotting); at around 10 percent, a commercial dehumidifier should be run for a week or two until the floor is fully dried and can be sanded and refinished. Make sure you (or your installers) test the moisture content of the wood before sanding or replacing the flooded gym floor. Use a specialized moisture meter and test in multiple places as it’s possible that some areas have more moisture than others. The moisture content should be between 7-9% before new hardwood is installed or sanding begins (otherwise, the floor won’t cure properly). If the damage requires complete replacement of the sports floor, a like-kind system will be put into place so that you have the same quality floor as before the accident. 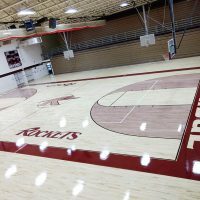 It goes without saying that complete gym floor resurfacing is more expensive and more time-consuming than patching and sanding the floor. 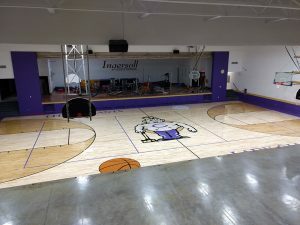 You can use the occasion (athletic programs, gym classes, and other events will be rescheduled because of the repairs anyway) to upgrade your sports floor, but you will have to pay the difference between the like-kind system and what you want (insurance adjusters will only pay for the same type of floor as before). 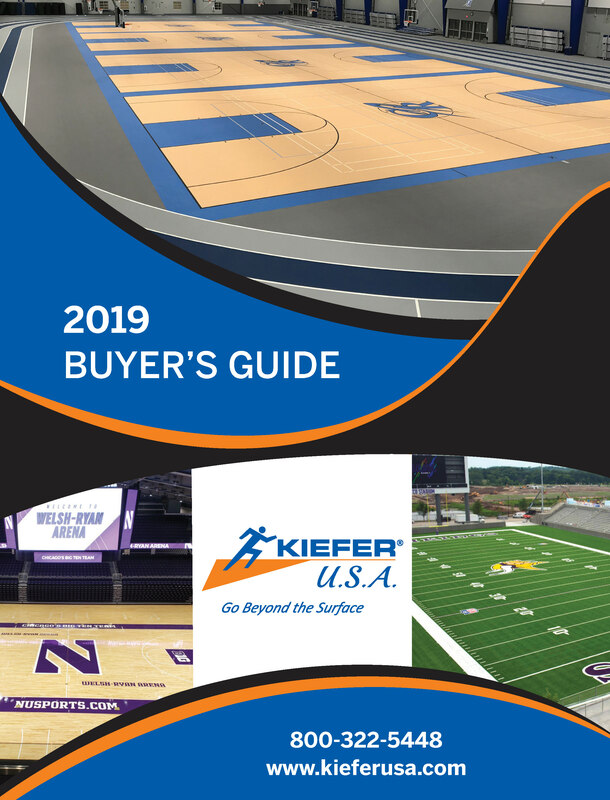 At Kiefer USA, we understand how important it is to get your sports facility back in operation as soon as possible after a disaster. 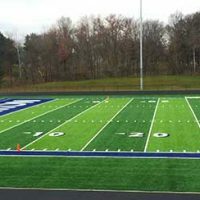 As the nation’s leading athletic surface design and installation company, we can provide the best possible solution for your individual case, repair or replace your sports floor in a quick and effective manner, and get your facility back on track within a few short weeks. Call us at 800-322-5448!